The Historic Sports Car Club’s Historic Formula 2 FIA International Series will wrap up in style with a fabulous 27-car grid for the final two races of the season at Dijon-Prenois in France this weekend (13/14 October). The sight and sound of another fabulous Historic F2 field racing at the three-dimensional former Grand Prix venue will be a major feature of the event and the field has quality to match the quantity. 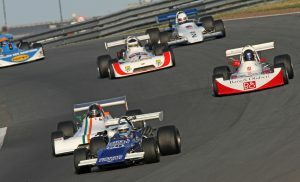 The high-profile Dijon Motors Cup also features a double-header for the HSCC Historic Formula 3 Championship and a round of the FIA Lurani Trophy for Formula Juniors. One of the weekend’s headline grids will contest rounds nine and ten of the Historic Formula 2 Series. After free practice on Friday, the Formula 2 pack has qualifying on Saturday morning and two 25-minute races, one on Saturday and one on Sunday. Drivers from six countries in seven makes of car are due on the grid at Dijon. Current top overall scorer is Frenchman Robert Simac (March 712M) and he is favourite to secure the Jochen Rindt Trophy for the 1600cc Formula 2 cars. His closest class rival is Luciano Arnold (Brabham BT36) but the recent formbook could be shaken up by the return to the series of 2007 and 2009 overall champion Martin Stretton (March 712). Paul Bason (March 712), Julian Stokes (Tecno) and Roger Bevan (Lotus 69) add more quality to the class. The fastest cars of all contest the Bruno Giacomelli Trophy for the later 2-litre F2 cars and Mike Bletsoe-Brown is almost there as class champion in his Chevron B27. However, the absolute pace at Dijon should be set by Matthew Watts (March 772), Mark Dwyer (March 742), Marc Devis (March 782) and series newcomer Ben Mitchell in the ex-Stephen South March 782, which will race for the first time in more than 30 years following a complete restoration by Matthew Watts and the team at Retro Track and Air. Three Ralt RT1s for Mike Wrigley, Frenchman Charles Veillard and single-seater newcomer Michiel Smits take on the Marches along with the rapid Chevron B40 of Chris Lillingston-Price. Paul Tonkin (Chevron B29) is already confirmed as the winner of the Vern Schuppan Trophy for the earlier Formula Atlantic cars after a tremendous first season at this level. At Dijon, he will go up against Nick Pancisi (March 712), Mark Goodyear (Lotus 59/69) and Australian racer Peter Brennan (Brabham BT40). In the Gilles Villeneuve Trophy for the later Formula Atlantic cars, Matthew Wrigley (March 79B) and Frazer Gibney (March 76B) have the pace to challenge for the overall podium. Finally, the Jim Clark Trophy caters for the early non-wing F2 cars and features Australian visitors Stephen Weller (Elfin 600B) and Wayne Wilson (Brabham BT21C). Jon Milicevic is already secure as the overall winner of the Historic F3 title this season, but the Dijon weekend has a cosmopolitan field including Italian racer Enrico Spaggiari (Lotus 41X), local ace Francois Derossi (Tecno) and Swiss racer Christoph Widmer (Brabham BT18A). Heading the British contingent is Peter Thompson (Brabham BT21).